Oh, those hardy pioneers, all quarter million of them. Between 1841 and 1869, they headed West, seeking new opportunities, Manifest Destiny, gold, adventure, and more. The California Trail - some 2-3000 miles long - was one route some of them trod, on horseback, on foot, and with their covered wagons from Missouri River towns to Northern California. The Boise-Kelton Stage route started in Kelton, Utah, north of the Great Salt Lake, (the closest stop in southern Idaho) and ran up to Boise. It followed Ben Holladay’s 1864 mail route and became the preferred road between Kelton and Boise for stagecoaches and freight wagons. and crosses the California Trail near the landmark Twin Sisters peaks. You can still see the remains of a stage stop on the Boise-Kelton trail - and you'll ride right past it on Days 1 and 2 on the 50-mile trails. 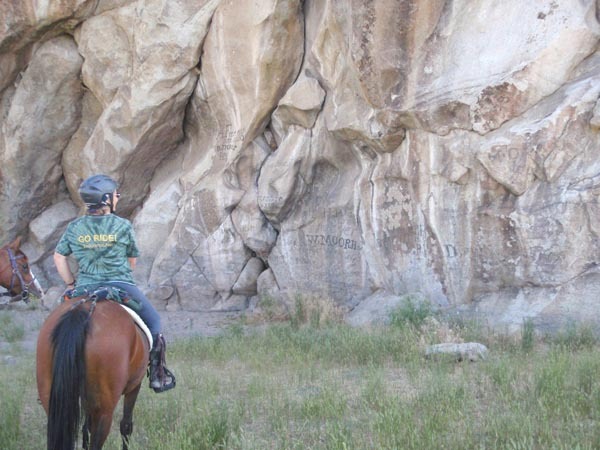 All distances, all days of the City of Rocks endurance ride, will trod over at least a small portion of the California Trail, and will pass by Register Rock, where immigrants' signatures can still be seen today scrawled in wagon axle grease. So saddle up, come ride a bit of history at the 3-day City of Rocks Pioneer endurance ride on June 7, 8, and 9: distances of 25 or 50 miles, plus trail rides.